Enjoy family and friends while celebrating the season with live music, delicious food and over 100 beautiful trees. Featuring entertainment by Noah Lis, former “The Voice” contestant. Live Auction with Rich Merrill, Auctioneer as well as many raffles. Food Stations and Cash Bar. Tickets available online for event and raffles. Sponsored by United Lens, Incom, Cornerstone Bank, Dexter Russell and Soleil & Suns Bakery. 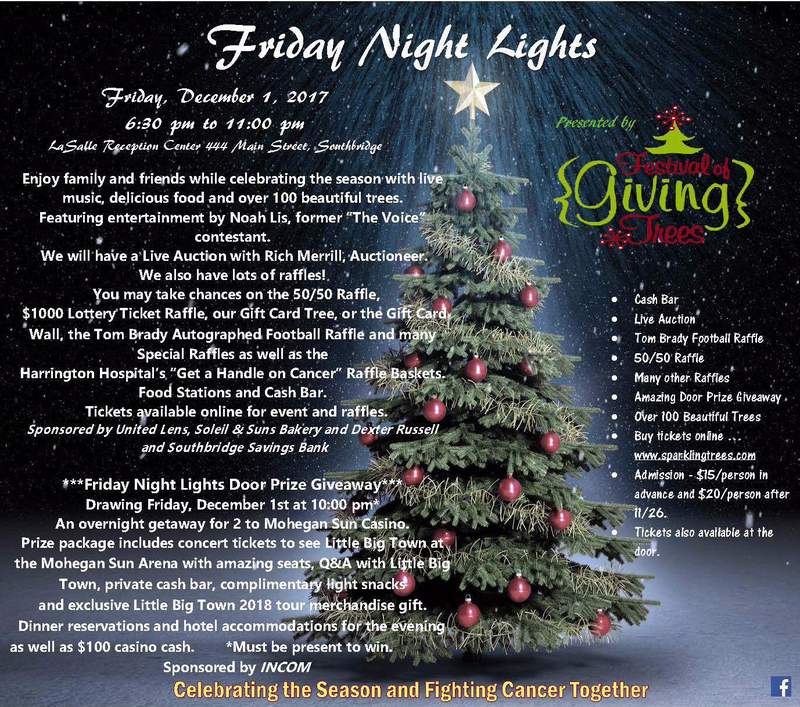 And thank you to our Live Auction donors Southbridge Credit Union, Karl Storz, Southbridge Rotary Club, Rick Predella, Montigny Landscaping, Richard McGrath, Garon Electrical Services, Boston Celtics, Tom & Diane Clark, Gary Galonek, Steve and Diane LaRiviere and SeaGar Charters. Cash bar. Ages 21 and over recommended. More information to come closer to event!